Activists bringing rifles into Texas chain stores in recent weeks have put the state at the center of a national fight over "open-carry" laws, reinforcing many Americans' perception of the Lone Star State as a haven for gun rights. In reality, Texas has one of the nation's more restrictive laws on the carrying of handguns—a policy that firearms-rights groups and state legislators are fighting to change. Those efforts, however, have been unsuccessful: Legislation in recent years proposing to allow people to carry handguns visibly has stalled. 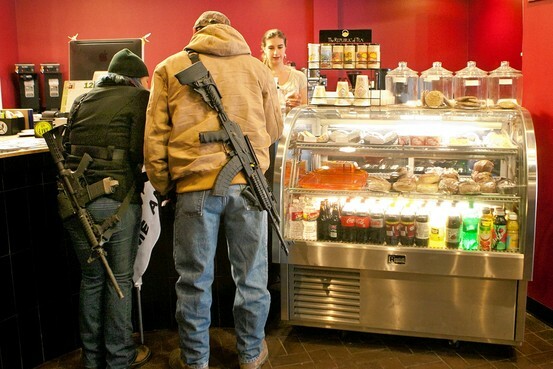 Proponents of open carry say they have resorted to toting long arms such as rifles into chains like Target and Chipotle to make a point—because it is all they are legally permitted to do. 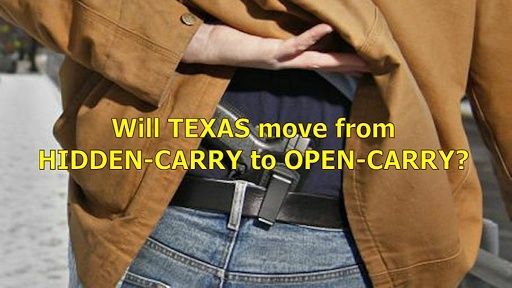 "We'd much rather carry a handgun," said Terry Holcomb Sr., executive director of Texas Carry, one of the open-carry advocacy groups active across the state. "A long gun is not conducive to everyday personal defense, going to work, going out, going shopping." Nationally, open-carry supporters have been pushing for years to change state laws to allow the possession of legally purchased firearms visibly in public. They argue it serves as a deterrent to potential crime. 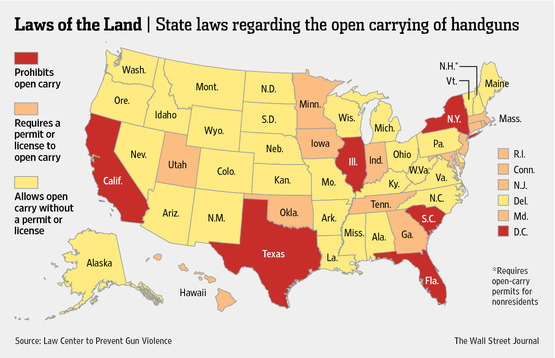 Thirteen states require a special permit or license to openly carry a handgun, while 31 allow open carry of legally owned handguns with no restrictions, although in some of those cases they can't be loaded. Texas is one of just five states, along with the District of Columbia, that doesn't permit citizens to openly display a legally registered handgun. On that issue, Texas finds itself in the company of states including California, New York and Illinois, even as Texas has loose restrictions around the sale, licensing and registration of firearms.